TULARE, CA. — Former Dolphins running back and NFL Hall of Famer, Larry Csonka, was the keynote speaker during a fundraiser dinner, auction and meet-and-greet that was held on Saturday, Feb. 28, at the International Agri-Center in Tulare, benefiting the Tulare High athletics and student activities. Source: Fresno Bee. 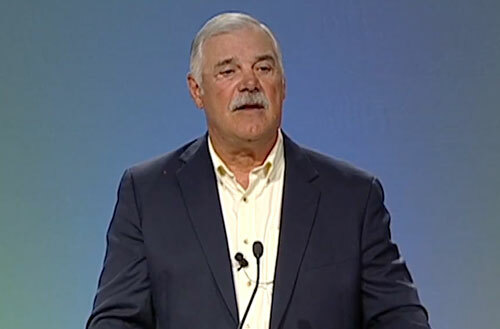 Photo shows motivational speaker Larry Csonka discussing his childhood in a 2015 video clip. Four former Tulare players now in the NFL were also honored: Cleveland Browns linebacker Zac Diles, Broncos tight end Virgil Green, Saints offensive lineman Bryce Harris and Chicago Bears receiver Marquess Wilson. Watch Larry Csonka speaking about his childhood in a 2015 video clip. Hall of Fame running back, Larry Csonka, played for the Miami Dolphins from 1968-74 where he was a two-time Super Bowl champion and named MVP of Super Bowl VIII. He earned All-AFC honors four times and was named All-Pro in 1971, 1972, and 1973. He was also selected to play in 5 Pro Bowls. Csonka was inducted into the Pro Football Hall of Fame in 1987 and his #39 was retired by the Miami Dolphins in 2002. Sports Speakers 360 is a booking agent for pro athletes. If you would like to book Larry Csonka for a speaking engagement, appearance or endorsement, contact Larry Csonka’s booking agent for fees at 1.855.303.5450.